We think our readership has a right to know who has been telling ASU's stories, so we're continuing our Q&A series with our editorial board with our editor-in-chief, Arren Kimbel-Sannit. Here in Phoenix, like 32nd Street and Shea Boulevard by the mountain preserve. My mom's a ceramic artist and she teaches at Phoenix College. My dad is an anthropologist and a professor here at ASU. My parents both lived in Berkeley for a long time, so that tells you everything you need to know. They are very good people; I love my parents. Especially having left home, I've maintained a really good relationship with them. Growing up, I wanted to be an ornithologist because I thought birds were sick. It's also why I started playing the flute. (I wish so much that I was joking). The first indication that I wanted to be involved in journalism was when I wanted to be a photojournalist, then I became interested in writing. I worked for my high school paper, edited the high school paper — it was a disaster, and nobody read it, but it was the first time that I'd ever published anything, so that was cool. What was most important to you when you took on your editor-in-chief position? The biggest thing I wanted to do was incentivize reporting over being a part of the editorial hierarchy. It's just more fun. For a long time, reporters who are good got brought up to editorial roles, so we had these deficits in the reporting staff because people with promise stopped performing because they started editing. I wanted to create new reporting positions that were well-paid to make sure that we had the ability to cover serious stories with nimbleness and depth. I wanted people, in general, to think of themselves as newspaper writers and to focus on events that were going on around the community. What are you going to miss most about The State Press? I'm going to miss the ability to identify things on campus that I think are worth covering and manifesting that coverage into existence. The reason that this position is a cool experience is that you can really put stories into a broader context that is difficult to do when you're a reporter because you're so invested in each individual piece. I think that's really valuable for understanding how these narratives get crafted and how the media influences people. I’ll obviously miss everybody who works here. It has its moments when it's less than great, but when you spend as much time as you do out here, you miss it. No matter what happens, you feel separation anxiety. I'm just going to miss the overall holistic experience. 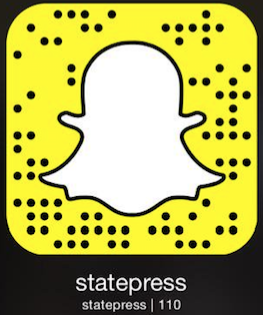 What's been most rewarding about your time at The State Press? The ability to understand really intimately the relationship between the publication and the broader community. Having been put in the circumstances where I can create that understanding for myself has been really valuable. I was only a reporter for a year. I was fine, but I don't think it was my priority then like it is now, so the bulk of my time has been spent as an editor. That's been really formative because a lot of people out there in the world of journalism have not spent time as an editor. I think it's helped my ability to report because I can understand how my story would fit into the broader context. What advice would you give to a young journalist? I am a young journalist; I need advice from other people. There’s a lot of personal and professional development that I still have yet to undergo and that I will continue to undergo. In seriousness, I think the best advice I can give is that if you really want to do it, if you're 100 percent sure that this is what you want to do, there is no wiggle room to waffle or to equivocate about how into it you are. You decide to do it and then you put your all into it, and you write your heart out with every story and you report. If you could get any famous person’s face tattooed onto you, whose would it be and why? The Dos Equis guy. I will not elaborate.